We’ve all done it — signed into a video conference, waited for everyone to join, and began the meeting the moment everyone was ready to go — and forgot to hit the record button. There are many great reasons to record your meetings — maybe you want to capture every detail of a meeting without the distraction of taking notes, or perhaps there were people who couldn’t attend who you wanted to keep in the loop. Maybe you’ve just come to realize how valuable it is to have access to ideas exchanged in meetings, and now you’re recording them all. Whatever the reason, forgetting to hit record can be a big oversight. Which is why it’s a great idea to set up automatic meeting recording, so you’ll never have to worry about remembering again. Fortunately, many of today’s leading video conferencing systems include the option to automatically record your meetings starting as soon as the host joins the meeting. And most give you the flexibility to enable automatic recording programmatically on your terms, whether it’s for your entire organization, for a specific group, or just for your own meetings. Of course, recording your meetings is only half the battle. Most of the time, you want to be able to share those recordings with others. Or you might realize you need to revisit a specific moment from a past meeting, but have no idea which meeting you need to re-watch (or when in that meeting the specific moment occurred). Your video conferencing systems don’t have answers for those challenges. So what can you do? Sharing meeting recordings securely with colleagues or making them easy to find is something most video conferencing solutions simply can’t do. Even if you set up your company’s meeting recordings to save to the same place, there are a few problems every organization encounters without another solution that makes managing those videos easier. 1. You typically can’t just send a video via email. Most meeting recordings, unless they are very short meetings, will end up being multi-gigabit files — much too large to share via email. That means most often, your people will instead upload their meeting recordings to file sharing sites like Google Drive or Dropbox. But file sharing sites aren’t a great workaround — most aren’t optimized for sharing video files, and none make it possible to search through your videos to find specific information. Worse, depending on which system you’re people are using and how they’ve logged in, there may be data security issues to consider when sharing company meeting videos in this way. 2. Videos won’t automatically play on every device. Video files are more complex than text documents. Not only are they large, but there’s no standard file format that will play on every PC, Mac, and smartphone used by the people in your organization. Some video conferencing systems even record videos in proprietary file types that most people can’t be played without first downloading and installing special software. It’s something that’s often overlooked until someone tries to share a video file with a colleague that won’t play. 3. Searching meeting recordings is hard. If your organization is recording most or every meeting, you’ll quickly build a large library of videos with little to distinguish them from each other aside from a date or meeting name. That means finding the right video in your archive can be challenging. And finding the exact moment inside of a video where something specific is discussed is seldom possible from your video conferencing system, leaving employees to either resign themselves to watching the entire meeting recording, or to click blindly through the video timeline in the hope of stumbling into the 5-minute section they wanted to review. 4. Your meeting recordings may not be secure. Whether you’re using your video conferencing tool’s cloud storage or the aforementioned Google Drive or Dropbox, you run the risk of your sensitive internal meeting videos ending up in the wrong hands. If an employee chooses the “anyone with this link” can view option, indeed, anyone with that link can view it whether they are supposed to or not — and you’ll probably never even know it got into the wrong hands. Using your video conferencing system to automatically record your meetings is a smart way to preserve the information and ideas your people are trading. But there’s a better way to manage and share your meeting recordings. A video platform can integrate with your video conferencing software to automatically make your videos searchable and shareable, on any device. Panopto’s industry-leading video platform comes with out-of-the box integrations for video conferencing systems like Zoom, Skype for Business, Bluejeans, and GoToMeeting, which enable your company to securely share important ideas exchanged in meetings at scale, automatically. A meeting recording can be shared and streamed on any device as soon as the meeting ends. Anyone within your organization can search any word spoken or shown inside your videos and jump to the exact moment it’s mentioned during a meeting. Uploaded meeting recordings are private and secure by default. Sharing settings can be changed for a single video, an entire folder, or your whole video library. Video analytics enable you to track viewing and engagement stats with all of your meeting recordings. So what are the right video tools for your organization? 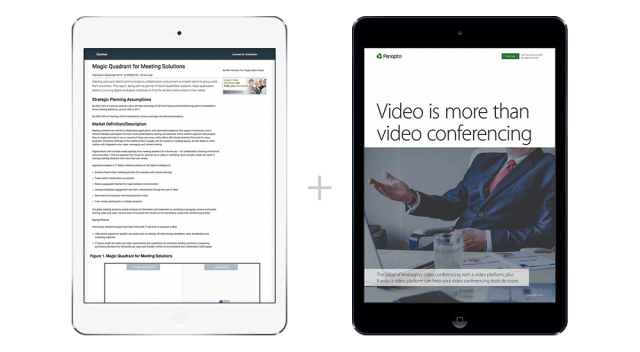 Find out, with Gartner’s Meeting Solutions Magic Quadrant report and Panopto’s Video is More Than Video Conferencing guide. Click here to download free copies of both reports.